Love And Theft features 12 brand-new Bob Dylan compositions recorded this spring with Bob Dylan’s touring band, augmented with other musicians including legendary Texas keyboard player Augie Meyers. The release of Love And Theft marks another milestone in the career of one of the world’s most extraordinary artists, and comes amidst one of Bob Dylan’s most creative and prolific periods. In only four years since the release of the platinum Time Out Of Mind, Bob Dylan has performed nearly 450 concerts around the world. He also wrote and recorded “Things Have Changed,” featured in the film Wonder Boys, for which he received both the Academy Award and Golden Globe earlier this year. Love And Theft is an album for the masses, not just for the core Bob Dylan fans, the kind of record people are hungry for. 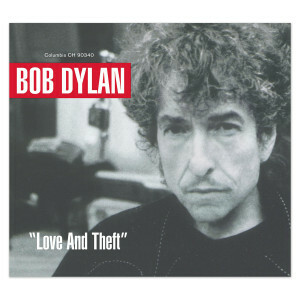 Bob Dylan is a one-of-a-kind artist making one-of-a-kind music, and Love And Theft proves it again.